If you are reading this post, you probably know about the love themed js1k competition. I tried to submit a new entry before the deadline on March 14th, but I failed to do it. I was able to complete it on time, but I noticed a couple of problems during the last minute, so I told Kuvos, organizer of js1k to cancel its release. The first and most notable problem was speed. I developed the thing on my recently bought high-end PC, and I had the error of not testing it on any older machine during development. In the new PC everything was fast and full framerate, but then I tested in my other machines, I noticed it was overkill, unacceptably slow and totally killing the visual effect. Be warned that even the low res version might be too much for some old computers and for some browsers. And note it is a bit over 1kb, but it fits in less than 1kb after using JSCrush by aivopaas. The only problem with Perlin noise for js1k entries is that a perlin noise implementation is a bit too big for 1kb. It fits in 1kb, but it would not leave too much room for other code. So I tried to make a texture similar to Perlin noise but by other method: a random walk. In the Wikipedia article about it you will find nice animations showing how it works. The only difference in my implementation, is that I don’t fill a full pixel at each position the walk traverses, but I just a bit, just like if I were using a non-full opacity brush, and this way it ends pretty similar to Perlin. The random walk needs a PRNG (pseudorandom number generator). As I wanted to create a cloud scene being always the same, I needed a PRNG with the ability to set its seed, and this way creating always on each run the same serie of (pseudo) random numbers. 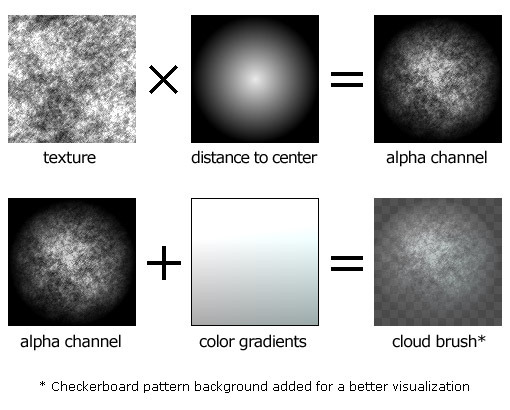 Returns an implementation-dependent approximation to the cosine of x.
I use the noise texture again to decide where to paint a cloud brush. If the texture at (x, y) is above a threshold level, I paint the brush at a position determined by x and y.
I consider y determine how far are the clouds. Further brushes are painted first so nearer are painted on top. 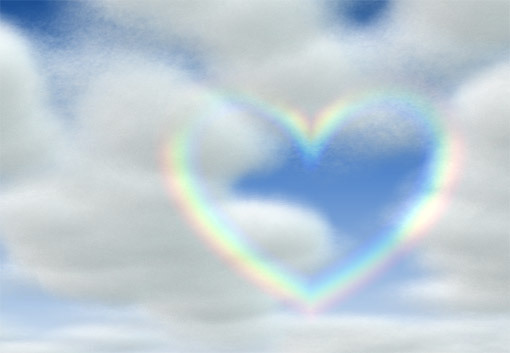 To add a perspective sensation, further clouds are painted littler than nearer ones. Finally, since I’m using only one brush, if it is repeated along a totally straight line it would be very noticeable the repetition causing visible linear patterns. What I do is to use again the noise texture to offset a bit the final positionto paint the brush, and this way I avoid those visual artifacts. Drawing the clouds scene takes almost all the time in the precomputation process, several seconds in the high resolution version even in a high end computer, so it is not possible to render it realtime with canvas right now. Moving the layers at different speeds, as I explained it in the CSS 3D Meninas post, cause the parallax 3d effect. Could I have been more kitsch? Not sure, but it fits the love theme of the competition. What I did was to draw multiple bezier curves, all with very few opacity and some displacement to cause the blurry effect common in rainbows and I used a canvas lighter composite operation to enhance its realism.